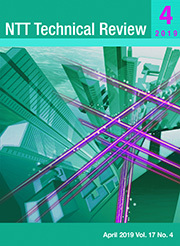 View all articles of the NTT Technical Review from back numbers to the latest issue. View the Digital Library (video clips, presentation files, etc.). under the direction of NTT. April issue is now on the site. March issue is now on the site. February issue is now on the site. January issue is now on the site. December issue is now on the site. November issue is now on the site. October issue is now on the site. September issue is now on the site. August issue is now on the site. July issue is now on the site. June issue is now on the site. May issue is now on the site. View from the Top, January issue is now on the site. Video clips, including 2006 reseach achievements, presented by NTT Science and Core Technology Laboratory Group are now available. R&D Forum 2007 Workshops presentation materials. NTT EAST is committed to achieving prosperous regional communities and sustainable development. On the basis of its original mission as a telecom carrier to connect people, it is now undertaking a new initiative as an information and communication technology (ICT) solutions company moving together with regional communities with the aim of solving the issues confronting its regional customers through the use of ICT. We asked Naoki Shibutani, Senior Executive Vice President, to tell us about the stance that NTT EAST needs to take to solve social problems and the progress it has made toward 2020. The team members of the Access Network Management Project at NTT Access Network Service Systems Laboratories have been engaged in research and development (R&D) related to the operation and management of access network infrastructure. This article reviews our recent R&D focused on innovating infrastructure maintenance and deployment. This includes techniques for carrying out facility inspections, condition sensing, and secure on-site work. It also introduces our vision for the future operation and management of access network infrastructure. This article is based on a lecture given during workshops at the Tsukuba Forum 2018 held in October 2018. Future optical access networks will require two important functions: high flexibility for mobile networks and Internet of Things networks, and low maintenance to reduce maintenance operations. This article presents the future direction of optical access networks and introduces FASA® (Flexible Access System Architecture), which is an important elemental technology. Optical-mobile cooperative control technology, a concrete example of applying FASA, is also introduced. Finally, FASA applications and standardization activities relevant to the architecture are explained. This article is based on a lecture given during workshops at the Tsukuba Forum 2018 held in October 2018. In the last decade, demand for high-speed data transmission has been growing dramatically not only for datacenter traffic but also for mobile and fiber-optic access networks. To meet the demand, NTT Device Innovation Center (DIC) has been developing opto-electronic modules, including a receiver optical subassembly, transmitter optical subassembly, intradyne coherent receiver, and a coherent driver modulator. NTT DIC has been working to accelerate the deployment of these opto-electronic modules on actual fiber-optic networks and has developed technology enabling full-digital virtual fabrication of high-speed opto-electronic modules on computer. In this article, we describe the latest simulation technology, focusing in particular on the opto-electronic modules and their capabilities and performance. The International Telecommunication Union (ITU) Plenipotentiary Conference was held from October 29 to November 16, 2018. This article introduces the results of the elections of senior officials and the member states of the Council of the ITU, and discussions of the main agenda items. Outdoor communication facilities are exposed to damaging weather and climate conditions and therefore require regular inspection and maintenance to ensure they operate safely and reliably. Such facilities also need to be placed in the optimum locations to reduce the potential damage from the exposure while best supporting telecommunication services. This article describes a map developed by the Technical Assistance and Support Center that illustrates the degree of damage from salt in different areas of Japan. This is the fifty-first article in a series on telecommunication technologies. Tsukuba Forum 2018 was held October 25 and 26. The theme of the forum was “Enhancing social well-being, moving forward together—Address social challenges with advanced access network technologies and smart maintenance and operation.” This article gives a brief overview of the speeches and exhibits presented at the forum. Input title, author, keywords, etc.